The 2008 HARLEY SPRINGER SOFTAIL in the picture IS THE SPECIAL ANNIVERSARY EDITION MOTORCYCLE. I have kept this softail in excellent shape; it has not got a single scratch on it! It is a beauty and a joy to ride. If you have any questions regarding the experience of riding and /or owning an 08 model softail you can reach me by e-mail using the comments form located directly below this ad using the space below that has been provided by GoGoCycles Used Motorcycles for Sale and PLEASE do not forget to send me your contact information in your email or to provide a phone number or email address so that I can respond with answers to your questions. GoGoCycles would also encourage our biker friends to write a review of the Harley Softail for sale or share any thoughts and/or opinions to make potential buyers aware of any problems that are commonly associated with this brand or to highlight its positive features and help our visitors make informed decisions. 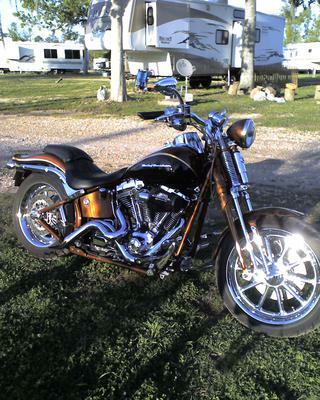 Thanks for taking a look at the picture of a 2008 Harley Springer Softail. If you are looking for aHarley Springer Softail for sale, GoGoCycles Used Motorcycles for Sale is the best place to find one for the right price!